There are a number of restaurants at La Franqui Plage and we tried the largest one last time we were there. 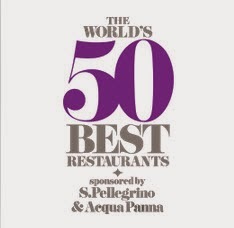 It was not good - the food was of not so good quality and the service unpleasant. This time we went a few steps down the street and found the little restaurant Le Bleu, which has a few tables in the shadow under some palm trees and looked quite nice. It is not a gourmet restaurant, but a very pleasant beach restaurant. The service was very friendly and the food was of good quality and well made. My wife had a whole grilled dorade that was big and perfectly cooked. I had an entrecöte, that was not an entrecôte, but more a sirloin. It was however tasty and perfectly cooked to my liking. The home made deep-fried potatoes were delicious. The restaurant had also a good selection of desserts, drinks and other small thing and, most important for a beach restaurant, they were open all day. It is only one little thing we did not like. 19 euros for an entrecôtes that is something else and 23 euros for a grilled fish, even if it was large and well cooked is a bit too much. Compared too the other place we have tried along the avenue it is however to recommend. As we did not want to disturb Restaurant En Bonne Compagnie across the canal we went to La Pénich that we had been to a couple of times before and found quite pleasant. The service is good and friendly. 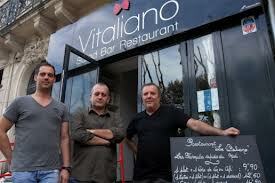 Many of the staff can speak English which is almost necessary around the Canal du Midi nowadays. The food is good and it is the kind of no-nonsense cuisine that you might appreciate for lunch. 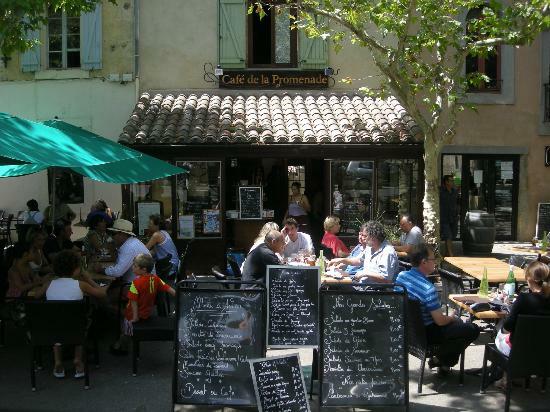 They have a large selection of pizzas and a couple of set menus with traditional French food. 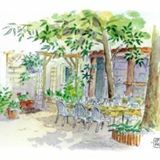 There is an inside restaurant and a few tables on the side of Canal du Midi. The main part of the restaurant is in the back garden which is divided into one open part there you can smoke and a glass-walled part what is possible to cover if the sun is to disturbing. The large open area around Canal de la Robine in Narbonne is now finished and has come out quite nice. A number of new and existing restaurants have appeared from the cement-dust and machinery noice. One of these that has suffered seriously from having a big hole in front of their entrance for months is restaurant Le Vitaliano. We visited the restaurant the other day and was very satisfied. They served two excellent pieces of meat – an entrecote for me and a piece of lamb to the ladies. Both were tasty, perfectly cooked and tender. The service was nice and professional. We will certainly return to this place again.